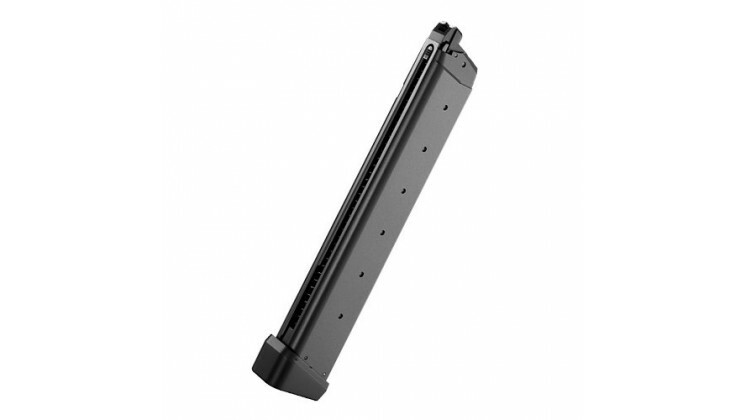 Compatible with Tokyo Marui Model 17 series weapons, this extended magazine doubles the capacity of your weapon from the stock 25rds to a whopping 50rds; particularly useful on the Model 18 with its thirsty rate of fully automatic fire. Gas charge inlet valve is hidden on bottom by bumper. Slide the bumper away to access the inlet valve for gas charging. Full metal construction.